Each year, the number of people sending SMS messages to each other decreases as communication between people is rapidly moving to instant messaging and social networks being the medium of choice. As consumers daily SMS needs to decrease we've seen an increase in the number of SMS messages from various companies. SMS is now being used as an enterprize solution by businesses needing to send out mass communication such as notifications, registration confirmations, money transfers, accessing accounts and so on. Despite the overall global decline in volumes of peer-to-peer SMS, many subscribers still pay monthly fees for access to SMS bundles, which are rarely being used. While at the same time the demand for automated application-to-person SMS is constantly increasing and is anticipated to grow at least until 2024. One blockchain company has identified this trend and seen it as an opportunity to use SMS as a commodity and salvage billions of dollars in lost revenue with an open marketplace. SMSCHAIN provides a blockchain platform with native protocol token (SMSTO) which subscribers can earn cryptocurrency by providing SMS delivery to clients (SMS Aggregators). 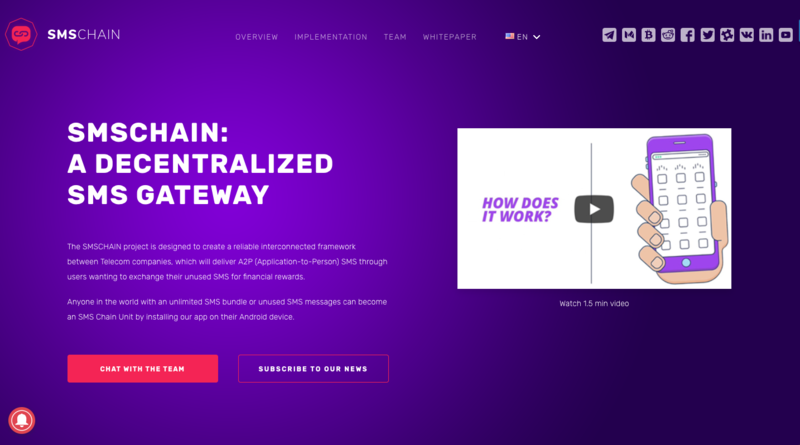 SMSCHAIN is the first blockchain-based SMS Gateway solution that provides a reliable global SMS delivery network, which enables mobile subscribers to exchange their unused or unlimited text messages for a financial reward. SMSCHAIN plans to build its own blockchain solution using a sidechain model1 with high transactions throughout, whose security and auditability will be ensured by the periodic anchoring to a public blockchain, such as Bitcoin. The implementation of SMSCHAIN technology will provide subscribers with a new stream of income while dropping prices of application-to-person SMS delivery for clients and providing truly global coverage due to the decentralised nature of the blockchain. The other numerous problems which SMSCHAIN is solving, such as, easy deployment and globalisation, equipment and maintenance costs reduction, the insurance of contract and payment compliance, are also discussed thoroughly in this work. The SMSCHAIN app allows for large companies such as Google, Facebook, WhatsApp and Twitter use your SMS messages to send verification codes and one-time passwords to their users around the world and you get your money for every SMS message delivered. Set your preferences for the type and number of SMS’s you want to be sent. You will need to keep your internet connection active to earn money by letting the app use your SMS bundle depending on your preferences. By doing this, you can make a passive income of several hundred dollars per month without much effort. SMSCHAIN has found a way for the seemly age-old practice we simply all accepted as common practice and turned it into a valuable marketplace. The network and app SMS Chain plan will create a way to monetize unused SMS's and help ensure consumers recoup spend on SMS that networks have saddled them with each month. If you want to know more about mobile marketing services and how that can be applied to your business, then feel free to contact us here.